..."For the people had a mind to work"
In October 1882, ten years after the incorporation of the town of Mullins, the Mt. 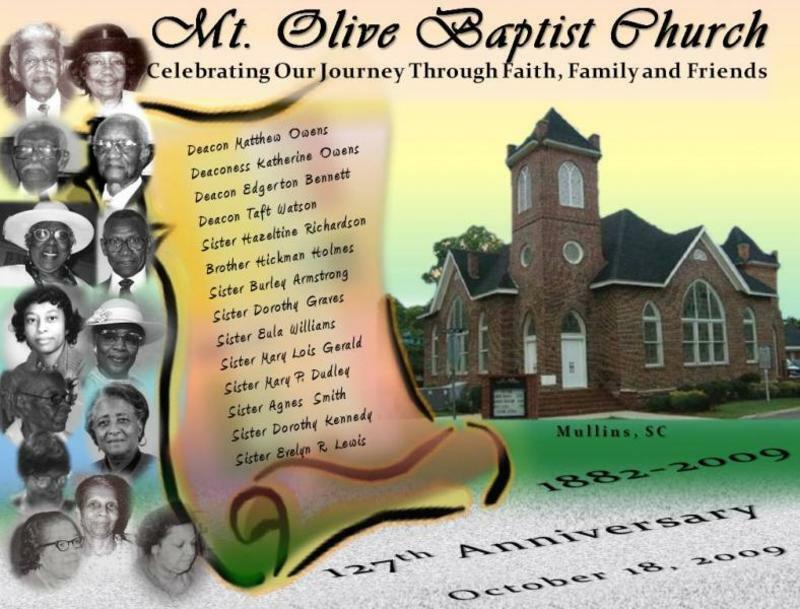 Olive Baptist Church was organized by a group of sixteen persons led by Brother Calvin Gerald. Being sons and daughters of slaves and former slaves themselves, the group set out from Nazarene Baptist Church, less than twenty years after the Emancipation Proclamation was issued, to organize a Baptist Church. The only black church within the town of Mullins was a new Methodist Church organized a few years earlier. Since the lumber mill town of Mullins was situated near a mainline railroad, they felt the need to establish a church closer to town. A Brush Arbor served as a meeting place for the fervent group; later a move was made to an old cotton gen on West Marion Street about one hundred yards off North Main Street. The name “Mt. Olive" was suggested by Sister Ava Gerald and has been used ever since. In 1885, the "Association" was held at Mt. Olive for the first time. Money left with the church was used to purchase one half acre of land on the corner of North Main and West Marion Streets for $10 from Mr. Gause Smith. Tobacco became an important crop in the area and Mullins soon became a large tobacco market with stemmeries and redrying plants along with cotton gins and a large lumber mill. Many people moved in the area in search of employment and the town blossomed. Soon, the sanctuary on North Main Street became too small and under the leadership of Rev. R.W.Jenkins, a track of land on the corner of Mullins and Yarboro Streets was purchased from the Yarboro and Daniel Estate for $500. Strawberry Street, named for the small patches of strawberries on it, was later changed to Church Street because of the location of Mt. Olive. In the fall of 1922, the brick structure that is now Mt. Olive was begun. A memorable move was made to the new site. Mr. Wade Ford, a black architect/contractor from Lake View, South Carolina, along with five craftsmen from the church membership, drew the plans and built the new Mt. Olive. Mr. Henry Owens, a devoted member, donated the bell, which remains in the steeple, various clubs including the Glade Star Banner Club, Metokas and the Willing Workers donated windows. Dr. W.M.Conliff, the first black doctor in Mullins, and many other friends were also donors. Mr. Ben Armstrong and the Elks, a fraternal order, laid the Corner Stone in 1942. The late forties and early fifties brought a steady increase in membership. In 1952, Mt. Olive Baptist Church entertained the South Carolina State Baptist Convention. A trend of the sixties and early seventies, affecting the Mt. Olive and other churches in the area, was an exodus of young church members from the South in search of a better way of life. In 1956, under the dynamic leadership of Dr. Jasper Lee Brooks, Mt. Olive expanded by adding a new wing, the Educational Building which faces Church Street. Mr. John Blanche, a Black architect from South Carolina State College, Orangeburg, South Carolina designed the new edifice. Since its humble founding, Mt. Olive has been blessed with strong leadership provided by the following pastors: Rev. Simon Owens, Rev. Frierson Lewis, Rev. Parnell, Rev. Handy Ham, Rev. Pinson, Rev. J.R. Brooks (father), Rev.Badin, Rev. Mcphail, Rev. R.W. Jenkins and Dr. Jasper Lee Brooks (son), who was the Shepard of Mt. Olive for more than a half century. Rev. Columbus Black was chosen as pastor in February 1980. Mt. Olive's Centennial Celebration with its motto, "We have come this far by faith," was held in 1982 under Rev. Black's leadership. In 1986 the Educational Building was remodeled by closing the breezeway leading to the sanctuary and enlarging the assembly room and the kitchen area. Again, Mt. Olive's skilled masons and carpenters assumed responsibility for the majority of the work completed. Rev. Frank Butler was called to Mt. Olive in 1988 and remained until 1992. Under his leadership, the sanctuary was painted and the floors were recarpeted, new roofing and vinyl siding on the exterior wooden trimmings were completed and the pews were refurbished. After Rev. Butler's tenure, Rev. Marvin McAllister (wife Patricia) of Florence, South Carolina was called to the pastoral ship. Under his guidance, the restrooms were remodeled, the yard was landscaped and paved, and the outside doors were replaced. Through the Guidance of the Holy Spirit, he led Mt. Olive to higher heights, broader dimensions, and deeper realms of service to God and His People. On August 17, 1999, Mt. Olive was formally nominated for listing in the National Register of Historic Places by Fannie Leonard Simmons, a 50-year member of the Church. Significance for the nomination was accomplished by reason of the Church's artistically valid architectural design and the authenticity aesthetic qualities and its influence on the "Black Experience" in the Mullins' Community. Then, on June 15, 2000, the Church was officially listed in the National Register of Historic Places of these United States under our One God. Later, on July 7, 2002, a South Carolina Historical Marker, which had been erected earlier on the Church's grounds, was unveiled by Hazelteen Richardson, the granddaughter of Ava Gerald one of the founders, and it was dedicated by Pastor Jeremy Bethea to the congregation. Under his wise and visionary tutelage, God has blessed the Mt. Olive Family tremendously. The sanctuary was restored back to its orginial beauty, new doors were hung, and new floors and carpeting were installed in the Sunday School rooms. Adjoining property on Mullins Street was purchased, and the first church van was acquired. A new church constitution and by-laws were instituted, a Media Ministry established, and the Inspirational Choir was formed. Pastor Bethea met and married his lovely wife Kandace; and they have been blessed with a beautiful son, Jamison and daughter, Jillian. Mt. 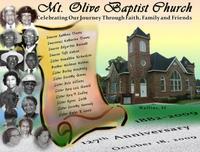 Olive Baptist Church remains a strong, viable institution with a glorious heritage. Its early founders lighted a torch, which pierced the darkness of enslavement, and the eternal flame remains a beacon of light to humanity.